When I first heard about Nancy's book Coldwater Revival, I must confess that I didn't buy into all the hype. The word lyrical was often bandied around. Well, when my book arrived and I started reading it, I finally understood. The book has a literary/lyrical voice, and the story is intriguing. I loved it. I've know her online for quite some time, and I'm looking forward to meeting Nancy Jo face-to-face. Nancy, how much of yourself do you put into your characters? There is something of me in all of my characters. But my characters are mainly made up of composites of people I know and have known over the years. Creating characters isn't a conscious thing I do. I just see my character, and know his/her feelings and thoughts. This, along with everything else about my writing, comes to me as a gift from our Heavenly Father. I know what you mean. Isn't it wonderful when He introduces us to these people? What is the quirkiest thing you've ever done? I have done so many quirky things in my life, it's hard to pinpoint just one. But what immediately comes to mind is the way I tend to mismatch my stockings with my outfits. For twenty-one years I taught school. I would get up in the predawn and dress, but when I got to school and looked down at my feet, my hoisery/sock/stockings often clashed with what I was wearing. That's what comes to mind, but perhaps I'm just too embarrassed to mention the many other ways I am quirky. When did you first know that you were a writer? I knew I was a storyteller from grade-school on. I told stories to my sisters, later my children, my students, and now my grandchildren. I love to tell stories. But I didn't discover that I was a writer until about 5 1/2 years ago. Once I began writing, that was it. I knew then that I was meant to write. I feel writing is one of God's purposes for my life, and I pray I'll be able to write for Him for many more years to come. What is the range of kinds of books you like to read? I enjoy reading most fiction, especially historicals, romance and contemporary novels. But if a book has a good story, I'll read it, no matter the genre. Mysteries and time travel also intrigue me. What other books, whether published or not, have you written? Coldwater Revival is my only completed novel. But I wrote for a long time on my first novel, and then spent some time on a second novel. I completed neither, but I learned so much as I practiced on those two books. I've also written several childrens' books, and hope to get them published someday. It's difficult to hold onto your sanity and keep pace with the demands of life. But I found out early on in my writing that I HAD to seek God before I could attempt any mission or ministry for Him. On the days I don't have my quiet time with God, and don't delve into His Word, then I feel totally lost the entire day. So I make that a priority and He somehow stretches the minutes and hours so that I can keep up with life's demands. My husband helps me a lot, also. Do you recall the vacuum tubes at the drive-in window of a bank? That's how my characters' names seem to come to me. It's like I put my request for a name in a tube and send it up the way, and it shoots right back down to me - straight from God. I don't always get the name I need the very day I send up my request, but when the names DOES arrive, I have no doubts from Whom it came. Of the accomplishments I have achieved, I am most proud of my family. My husband, our joined family of children, and our precious grandchildren. Our families are a lasting heritage. Many other accomplishments last but for a short time. But our families just "keep on going" like the bunny in the commercial. If you could be any animal, which one would you want to be? I would choose to be a doe. Deer are graceful, beautiful, sure-footed and live together in small herds. And I know that does protect their fawns. So, a doe sounds just like the sort of animal I would choose to be if that were my choice. I love Tex-Mex food and so does my husband. We eat it a least once a week, and usually more often than that. I lived in El Paso for six years. There the Mexican food is more identifiable to the interior of Mexico. I learned to love that kind of Mexican food also. But Tex-Mex is my favorite. Coldwater Revival is a work of love. I gleaned memories from my childhood, worked with them until they were so deeply embedded in my heart that I felt I was part of the Falin family, of which I wrote. Coldwater Revival is a true-to-life story, with elements of grief-shattering loss, doubts, and a young lady's devastating guilt and shame. But it's also a story of victory, forgiveness and unforgettable restoration for Emma Grace Falin and her family. And it has a very satisfying conclusion. Thank you for spending this time with us, Nancy. I look forward to your next book. 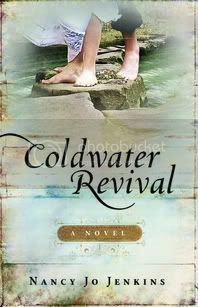 Remember, Reader, all you have to do is leave a comment on this post for a chance to win a copy of Coldwater Revival. Someone wins a book every week. It might as well be you. 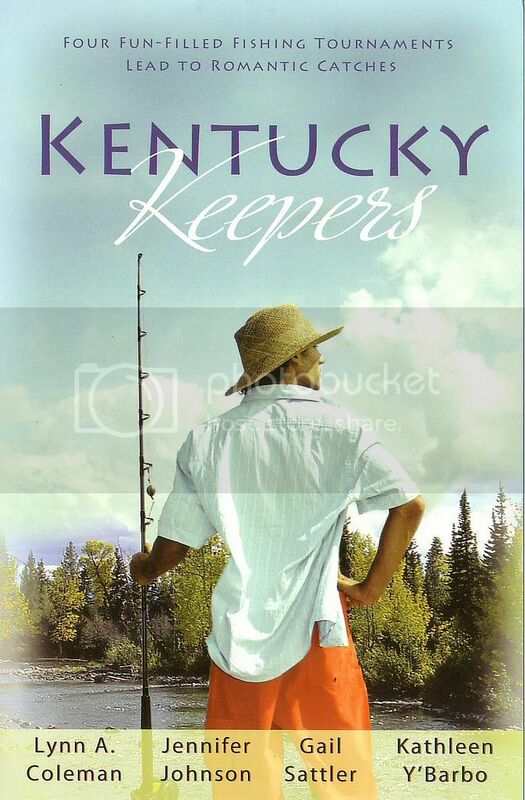 Also, there's still time to leave a comment on Gail Sattler's interview for a chance to win Kentucky Keepers. . . .Miss Menace is Debbie C. Please click on the e-mail link under my profile and send me your mailing address, so we can get the book out to you. 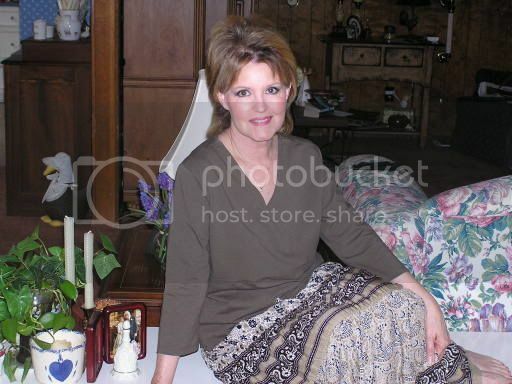 There's still time to leave a comment on Gail Sattler's interview. By the way, who wants to guess what color Gail's hair will be at the American Christian Fiction Writers national conference in Dallas in September? For more info on the conference, go to www.americanchristianfictionwriters.com . . . .and I have been friends since sometime in the early 1990s. We both have written for Heartsong Presents since then. Actually, Gail was chosen favorite author by the readers of Heartsong five years in a row, so she's in the Hall of Fame. Way to go, Gail. I know that when one of her books comes out, I read it as soon as I can. That girl can really spin a yarn! Be sure to leave a comment for a chance to win a copy of her featured book Kentucky Keepers. Gail, tell us how much of yourself you write into your characters. Well said, what is the quirkiest thing you have ever done? I once ordered a custom designed screen for the bay window in my living room, which is on the 2nd story and opens onto the roof, to have a special opening for my dog. Over a period of about 10 years I allowed our dog, a Standard Schnauzer to jump out the window onto the roof to watch the neighborhood and let the day go by. It was her favorite pastime. We've had people stop their cars and point. People who were out walking stopped and stared, then jumped in shock when the dog moved, because they didn't think she was real. Strangers have knocked on our door to ask if we knew our dog was on the roof. The only times I didn't allow her to go onto the roof was when it was raining or if it was too hot out there. I've seen pictures of that. When did you first discover that you were a writer? February 1995. A few months before that I had lost my job when the company I worked for closed. A friend gave me a bunch of books to read, which I really enjoyed because up until that time, I didn't have the time to read like I used to. When I was reading, the thought struck me that I wanted to try to write a book, too, and the rest is history. Wow, that's very time specific. Tell us the range of the kinds of books you enjoy reading. Mostly I enjoy romantic comedy, which is why that's what I write. I also enjoy cozy mysteries, because I don't want to read anything violent. In a cozy mystery, any violence happens offscreen, and I like it that way. I also enjoy women's fiction. Kentucky Keepers has quite a lineup of wonderful authors. What other books have you written, whether published or not? So far I've had over 30 category romance novels and/or novellas published. What hasn't been published so far is one cozy mystery, which isn't finished, and one mainstream fiction, which also isn't finished. Readers, you can see all her books at www.gailsattler.com. How do you keep your sanity in our run, run, run world? When I need a break, I take one. No one will fall down and die if the housework isn't done, and I'm on a first name basis with the people at the local pizza take-out joint. When I need a break, I read something that someone else wrote that I don't have to comment on. Sounds like a good plan to me. How do you choose your characters’ names? I have no pattern or formula. The names just come when I'm thinking the story through as I'm setting out my plot. I look in my local phone book for last names. I never realized how many authors use the phone book that way. Now why didn't I think of that? What is the accomplishment that you are most proud of? That one's easy. My biggest accomplishment is being a multi-published author. It's a lot of work, but it's fun work. Here are some fun questions. If you were an animal, which one would you be, and why? This isn't mine, I copied this off the internet somewhere, I don't have the source – I wanna be a bear. If you're a bear, you get to hibernate. You do nothing but sleep for six months. I could deal with that. Before you hibernate, you're supposed to eat yourself stupid. I could deal with that, too. If you're a bear, you birth your children (who are the size of walnuts) while you'resleeping and wake to partially grown, cute cuddly cubs. I could definitely deal with that. If you're a mama bear, everyone knows you mean business. You swat anyone who bothers your cubs. If your cubs get out of line, you swat them too. I could deal with that. If you're a bear, your mate EXPECTS you to wake up growling. He EXPECTS that you will have hairy legs. Yup..... I wanna be a bear. Don't we all? What is your favorite food? Chocolate. And don't think chocolate isn't a food, because it is. It's soul food. I totally agree. It especially must be soul food for authors. A lot of them have mentioned chocolate as a favorite in these interviews. Thank you, Gail, for spending time with us today. Readers, leave a comment for a chance to win this book. If you don't win it, go out and buy a copy. You won't be sorry. . . .of Andrea Boeshaar's book Always a Bridesmaid. Please click on the e-mail link below my profile and send me your mailing address. Thanks to everyone for your comments. 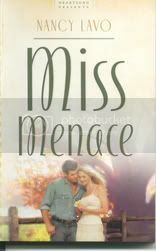 You still have time to leave comments on Nancy Lavo's interview for a chance to win a copy of Miss Menace. What is an Alli-Bag? A writer friend of mine, Diane Moody, is also the creator of Alli-Bags. She has created a Lena Nelson Dooley signature bag. The picture doesn't do it justice. It is beautiful. You can order bags at www.alli-bags.com . For the signature bags, click on the button on the left of the website. There are several bags that have been created for authors. She also has several bags that are on clearance where you can pick up a bargain. These bags are well-made and sturdy, but every Alli-bag also has a pearl sewn in, because every woman needs a pearl. A Lena Nelson Dooley signature Alli-bag filled with my books will be featured in the Silent Auction at the American Christian Fiction Writers national conference in September. Where else but in Dallas, Texas? Get all the information on the conference at www.americanchristianfictionwriters.com . I'm really happy to introduce a long-time friend to you. 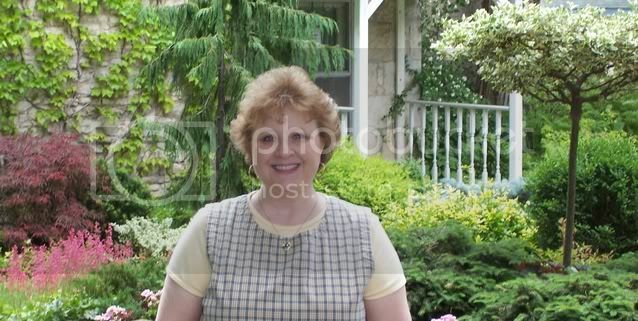 Nancy and I went to the same church years ago when we each sold our first books to Heartsong. Over the years we've both grown in friendship and as authors. Her most recent book is Miss Menace, published by Heartsong. I loved this delightful contemporary comedy. Remember, if you leave a comment, you'll have a chance to win a free copy of this book. I don’t consciously put any of myself into my characters. Having said that, I’m certain it’s impossible to filter out my experiences and perceptions from my work. I’m guessing that a bit of me creeps in undetected. I don’t think I do quirky things, which could mean one of two things. Either I’m a very staid individual or I’m so weird that quirky seems normal to me. Should I tell them which I think it is? Maybe I'll let them guess. When did you first discover that you were a writer? And you do it very well. Tell us the range of the kinds of books you enjoy reading. Romance, romance, romance. Not much of a range, huh? Occasionally I’ll stray from romance and pick up a popular fiction title or a mystery, but they rarely satisfy like a good romance. I think it’s the guaranteed happy endings of romances that keep me coming back. I’ve written five books for Heartsong, and one for Silhouette Romance. I have a couple more completed books collecting dust under my bed. Well, pull those out, dust them off, do a re-edit, and get them out there. How do you keep your sanity in our run, run, run world? I walk three miles every day. The fresh air and exercise are a terrific antidote for stress. More importantly I spend time with the Father in prayer and in His word. No matter how crazy things get, He keeps me grounded. From the phone book. No kidding. I can come up with first names without any trouble, but last names always stump me. So I flip open a phone book and skim along until I find a name that strikes my fancy. I have been known to borrow my friend’s names for secondary characters. My precious family. By the grace of God my husband and I have raised three wonderful children who love God and one another. Now that’s what I call an accomplishment! Probably a parrot. I talk a lot and favor bright plumage. I like that. What is your favorite food? I had a great time writing it. And the readers enjoy reading it. Thank you for giving us this peek into your life, Nancy. Remember to leave a comment, and there's still time to leave a comment on Andrea Boeshaar's interview. . . .is the winner of Carrie Turansky's book Along Came Love. Please click the e-mail link on the left column and leave me your mailing address. There's still time to leave a comment on Andrea Boeshaar's interview. I'm reading her book right now, and it's very good. A new interview will go up tomorrow. I've known Andrea online as long as we both have been in American Christian Fiction writers, and getting to see her in person at the national conferences is such a pleasure. She a sweet, kind person with a lovely smile and big heart. It's with pleasure that I present her to you. Remember to leave a comment for a chance to win a copy of Always a Bridesmaid. Andrea, tell us how much of yourself you write into your characters. I think there is a little bit of me in all my characters. I know what you're talking about. How can we not write what we know, and who do we know best? What is the quirkiest thing you have ever done? Sounds wonderful to me. When did you first discover that you were a writer? I’ve loved to write ever since I was a little girl. Then in 1984 I began writing with the intent to be published. I wanted to be the next Danielle Steele. But God took hold of my heart (and my life) and changed my course in 1991 and I dedicated myself to write for His glory. I'm glad He did. I love your books. Tell us the range of the kinds of books you enjoy reading. I enjoy Christian fiction, ranging from the more literary, like Jamie Langston Turner’s novels to category romance, such as Heartsong Presents and Love Inspired books. I also enjoy some of Joyce Meyers’ nonfiction. Also in my bookshelf are books by Bill O’Reilly and Sean Hannity. And then there are all my “how to” writing books! I know those who visit this blog will be glad to go there and check them out. How do you keep your sanity in our run, run, run world? It’s not easy!! But whenever things get tough, God draws me to His word. It’s there, in the Bible, where I’m reminded of His many promises and how God gives us that “peace that passes all understanding” when our world spins out of control. So true. How do you choose your characters’ names? Various ways. Sometimes I’ll hear the name and it plucks a chord in my creativity. Sometimes I go to my “Character-Naming Sourcebook” (WD Books) and search through the pages until I find one that suits my character. I know what you mean about a name striking a chord. I have numerous sticky notes on the credenza above my computer with names on them. What is the accomplishment that you are most proud of? My three sons. They are handsome, smart, responsible, capable Christian men. They all chose wives whom I adore. I now have three daughters too (and a 4 month old granddaughter). I guess my sons are more blessings (and gifts from God) than accomplishments. Nevertheless, I’m very proud of my family. How blessed you are! I didn't get my boys until grandsons. If you were an animal, which one would you be, and why? I don’t know. God made me a human being and I have honestly never had the desire to be an animal. Thank you, Andrea. Readers, she mentioned sending Broken Things to Mrs. Bush. I highly recommend that you read that complete three-book series. They're wonderful. You are the winner of Wish I'd Known You Tears Ago by Stephen Bly. Click on the e-mail link under my profile in the right column and send me your mailing address, so we can get the book out to you right away. There's still time to leave a comment on Carrie Turansky's interview for a chance to win Along Came Love. You might want to visit them.